Simon says sit. Simon says stand. Sit. Stand. It’s totally your call! With the E200 S, the guys at scooter headquarters have outdone themselves with their latest addition to the electric experience… drumroll… a seat! Just think, you can switch between standing or sitting as fast as you change your mind about outfits. 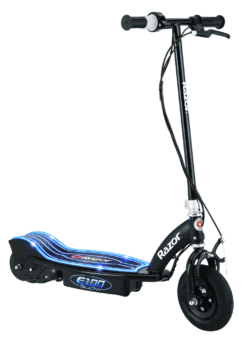 Electric FunMy kids love the Razor E200S! They love that the seat is removable and they can ride sitting down or standing up.